Welcome to a land you will never forget a land of snow-capped mountains and quiet river valleys, of ancient preserved cities and towering pagoda temples, of friendly people and fascinating folkways. Nepal offers unique pleasures for everyone-tourists, mountaineers, trekkers, poets and those in search of a personal Shangri-La and for causes besides the tribes. Nepal is a land for all seasons. Year around there are a myriad places to go, people to meet and sites to see. Year around there are exciting adventurous activities like Trekking, Mountaineering, Heli-Ski, White Water Rafting, Biking, Paragliding, Bungee Jumping, Rock Climbing, Cannoning and Jungle Safaris. There is a delightful, never? ending procession of colorful festivals. 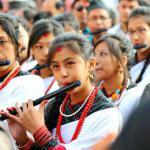 Nepal is a land where arts and culture are well preserved. The core of the mountain complex known asis the youngest and highest mountain system of the world. The name is based on the Sanskrit words, “Him” means snow and “alaya’ means abode. The Himalayas are huge mountain range stretching 3000 km. east to west and Nepal Himalaya is the largest and highest occupying nearly a third or 800 km. across, with eight peaks that rise above 8000 m. including the third pole of the world, Mt. Everest. gorges. Each of these mountain peaks or Himalayas in turn send out a web of urges stubbed with numerous peaks. It is not just the height that gives the Himalayas their grandeur, but it is also the tremendous contrast with the deep valleys that wind between the peaks. Government of Nepal has opened 326 peaks for the mountaineering activities among its numerous peaks. Ever since the country was first opened to climbers in 1949, Nepal Himalaya has become a great trailer of mountaineering activities and their success and failure have provided impetus to more men to meet the ultimate mountains. It is therefore, Nepal Himalaya through all ages has been the centers of attraction to the world, either may be a mountaineer or saint or philosopher or researcher or adventurer. Much of the Nepal’s land above 5,000 m. high is under snow and ice although the permanent snow-line varies according to aspect and gradient. Winter snowfall occurs up to an elevation of 2,000 m. and is much heavier in west. 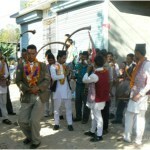 In the years to come, Nepal Himalayas is to be the symbol of international friendship and world peace.